In an effort to make gardening sexier to digital natives, Scotts Miracle-Gro is welcoming spring with what it says is a social media first: A crowd-sourced garden of flower-themed emoji. And it’s the lawn-and-garden brand’s latest effort to woo Gen Y to a passion people are more likely to associate with old ladies and rose bushes than city kids hooked on Instagram. Timed to the first day of spring, the effort is the joint idea of the company and agency 360i, John Sass, vice president of gardens, tells Marketing Daily, and stems from the knowledge that the long, dreary winter has left many people pining for flowers. 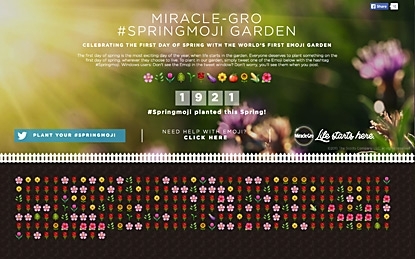 Miracle-Gro and 360i partnered with renowned developer Mroth (Matthew Rothenberg) of Emojitracker. Each time someone heads to #Springmoji, they can pick from the 12 emoji, which include eggplants, tomatoes, tulips and cosmos, and share them on Facebook or Twitter. Miracle-Gro then “plants” the emoji in its digital garden. While people may not be doing much with social media on the actual day of planting, “and we’re all for people using gardening as a way to step away from technology,” he says, younger people are keen to show off every step of their projects. The company also partners with Joy Cho, a top pinner who shares DIY gardening tips on Pinterest.